The journal seeks to contribute to research activities and communications within Russian and international scientific community. The periodical is supposed to be required by scholars and professors. The Editorial Office considers original manuscripts without any signs of plagiarism and corresponding to the following science directions (branches of science): juridical sciences, philosophical sciences. materials on the milestones of history of law, juridical science and education. We adhere to the ethical guidelines and rules accepted in the fields of scientific literature examination and publishing. Maximum accessibility and democracy is considered to be important. 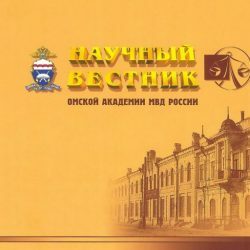 Publications and author’s copies including their postage are free, the journal issues are regularly sent free of charge to the educational and scientific organizations of the Ministry of Internal Affairs of the Russian Federation, leading national scientific and educational centers. The journal is listed in the Russian Science Citation Index (RISC). 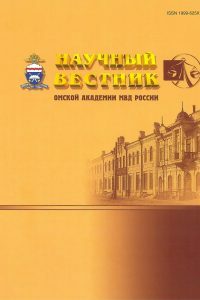 All the journal’s issues published since 2005 are available at the Scientific electronic library (http://elibrary.ru) and on the IVIS, Ltd platform, which is the partner and distributor of the East View Information Services, Inc. The journal is officially included on the List of peer-reviewed scientific editions where scientific results of doctoral and candidate of sciences theses are to be published. The journal is a peer-reviewed periodical. The review estimates the importance of the paper’s subject-matter, the level of scientific grounds of the theses, their novelty and significance, outlines positive as well as revealed manuscript’s arguable or negative points, makes recommendations to publish (reject to publish) the article or hand it back to the author for further elaboration. The editorial board is eligible to send submitted papers for reviewing, additional reviewing or reject them. The editorial board sends the manuscripts’ authors copies of the reviews or rejection with the grounds given. The manuscript must contain up to 0.5 author’s sheet (20,000 characters and spaces) including pictures, graphs and tables. Authors assume responsibility for the accuracy of quantitative data, citations, last names and proper names. The opinion of the editorial board can differ from the authors’ visions. Submitting the papers already published or submitted to other journals is not allowed. Submitting the paper for publishing the author agrees to locate it and metadata including photos in the informational systems the editorial board has appropriated agreements with. The periodical was founded and is published by the Omsk Academy of the Ministry of the Interior of Russia.